Chord Electronics teases TToby partnering amp for Hugo TT | What Hi-Fi? 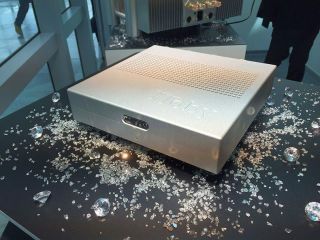 The Chord TToby is a desktop stereo power amplifier designed to be the perfect partner for the Hugo TT DAC. The TToby delivers 130W into four ohms and comes with balanced and unbalanced inputs to match the Hugo TT’s outputs. It also, says Chord, benefits from its switch-mode power supplies and is based on the same physical design as the Hugo TT. The TToby will be available around August to late summer for £2995. Chord has also announced the SPM1050MKII. It’s a 200W stereo power amplifier which is said to come packing a “raft of internal upgrades, plus a number of aesthetic improvements” over its predecessor. Chief among those upgrades are reduced output distortion and better isolation on the mains transformers which Chord says reduces interference for a cleaner sound. The MKII version, available now for £4995, features a vented aluminium lid and a new piano-black side panel option.